Digital Creative is placing talent with companies on an ongoing basis. Some apprentices are placed in their job several weeks or months before the cohort launches while others begin their new job as the cohort launches. Launch your career today and join our next cohort! All taught within the context of our partner companies’ real-world challenges. Read the recap of bootcamp from cohort 1 – here. 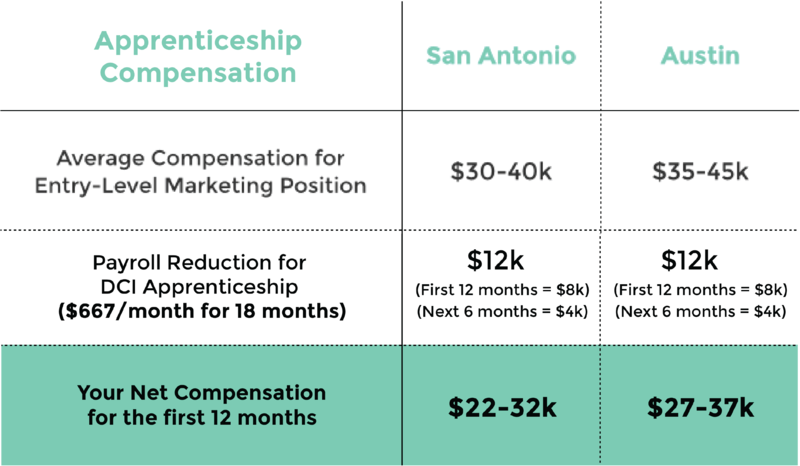 Let’s walk through how you will be compensated as a DCI apprentice working full-time for a local business (one of our partners) in San Antonio or Austin. 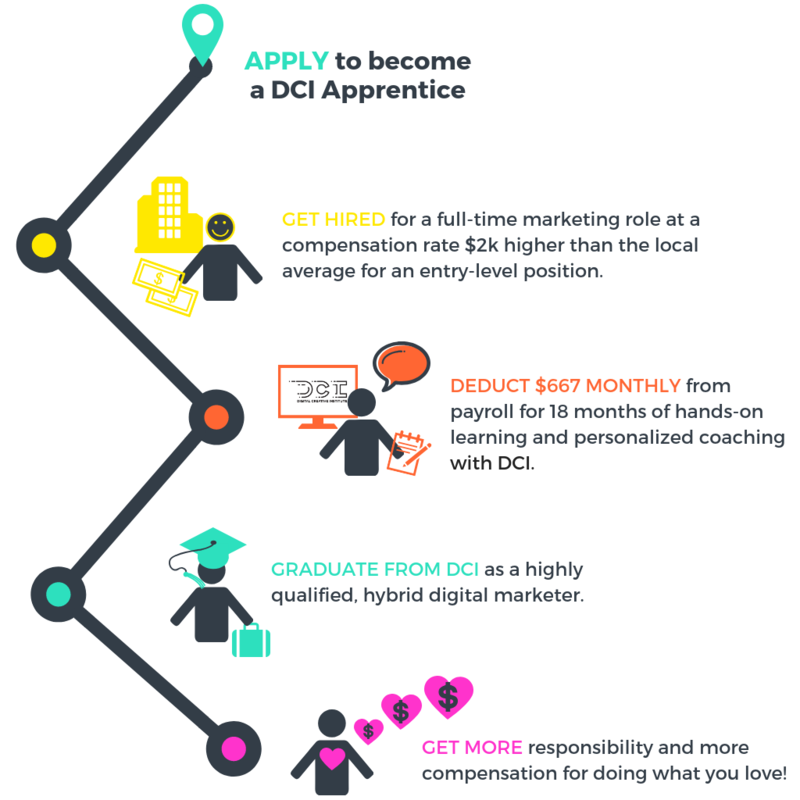 You’ll apply to DCI and if apprenticeship is the right fit, we’ll get you ready to apply for marketing jobs. We’ll then help you set up interviews and coach you through the job hunt process. If you are offered a marketing job from one of our partner companies, then we will talk to your employer and outline what your apprenticeship journey and learning goals will look like. For 12 months you’ll receive coaching, training and mentoring from DCI and after the year you’ll be a graduate and DCI fellow equipped with all the marketing skills you’ll need. Why choose the apprenticeship journey? Find out straight from a current apprentice! *The example above assumes a $2k employer contribution. Exact monthly payments are calculated after employer, grant and/or scholarships have been applied. What will your compensation be for the next 12 months? Here’s a chart with some estimations. DCI does not directly determine your compensation – that is between you and your employer. However, you will likely earn an average entry-level salary for a recent grad just entering the job market. The total cost of the apprenticeship is $14K. Most apprentices receive an employer contribution, workforce grant, and/or scholarship of at least $2,000, but even at the full amount, your monthly payments will not exceed monthly payments of $777 over the course of 18 months. Investing your time and resources now will result in accelerating your career. The 18-month payment option is interest-free and payments will be made directly to DCI as an automatic reduction in your paycheck. Total tuition cost for DCI is $14k. Contributions from your employer, grants and/or scholarships reduce the amount the apprentice is required to pay. The maximum payment amount is $777 per month, though often it is much less than this based on the aforementioned contributions from other sources. Climb Credit is a new kind of student lending company which focuses on financing career-building programs to help students get a high return-on-investment from their education. Not sure which is right for you? Don’t worry, you don’t have to make any decisions yet. And until you know what your full-time salary will be and subtract any contributions from your employer or other sources, it doesn’t make sense to commit to either yet. Still, if you’d like to make sure that 48-month plan is an option, you can fill out the quick loan application here. Completing the application will not commit you to anything, but it will give you information about what your monthly payments could be if you chose that option in the future.